Environmentally friendly folks will be happy to hear that several car manufacturers in Thailand will be selling passenger cars with the capacity to use a higher percentage of ethanol in ethanol-gasoline blended fuel (gasohol). These engines have been modified to use ethanol, a renewable fuel, with greater efficiency that older car engines. The gasohol currently available in Thailand labelled as gasohol 95 is only 10% ethanol, or E10. In the future, these cars will be able to use gasohol that is 20 % ethanol, or E20, while older car engines not modified specifically for ethanol will not. Toyota, Thailand’s largest manufacturer of passenger cars, has announced that the new Corolla Altis released in Thailand with be able to use E20 gasohol. These cars will be manufactured in Thailand, sold in Thailand as well as to Asean markets. Toyota plans to sell 2,600 units a month with each car priced between 709,000 to 969,000 baht. Passengers cars in the Toyota fleet are also being modified to use E20 ethanol, such as the Vios, Yaris and Camry. A few other car manufacturers, such as Honda, are also set to release E20 gasohol cars in the near future. At the 2007 International Motor Expo, Mr. Otaka of Honda, Thailand’s second largest manufacturer of passenger cars, announced that all of Honda’s 2008 car models will be able to use gasohol E20. For those of you looking to do your part to save the planet from the global climate change that is being caused by carbon dioxide emissions, consider buying one of the new Toyota or Honda cars that are using E20 ethanol fuels. These cars will also accommodate the increased use of ethanol fuels more easily that cars that are not designed to be used with ethanol fuels. You will also help to reduce our consumption of nonrenewable fuels and be part of the initiative to use alternative forms of energy which are renewable. For those of you enjoy nature and a bit of peace and quite, there are still relatively undeveloped stretches of shoreline along the Gulf of Thailand. In Chantaburi forest, there are protected coastal woodlands, mangrove forests and coastal forests, part of a vital effort to save this diminishing, yet crucial habitat. Kung Krabaen Bay, so named for the bay’s sting ray-like shape, is a fine example of Thailand’s mangrove forest conservation efforts. Mangrove forests are natural rare because they only exist in areas that provide the correct conditions. All of Thailand’s pristine mangrove forests are thought to cover only a third the size of Bangkok (7,761 square kilometers) and less that 0.5% of Thailand’s total land area. 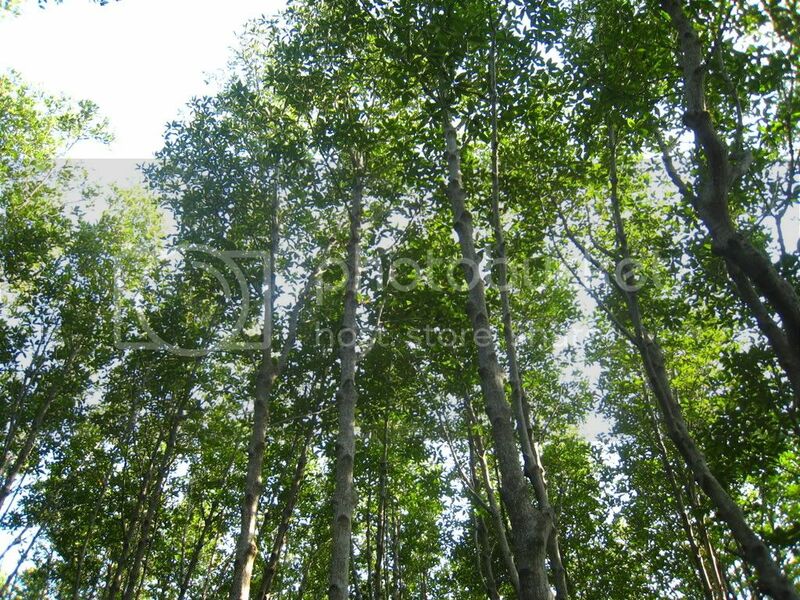 These forests have a tall canopy, often reaching 15-20 meters. At Kung Krabaen Bay, the forests cover 100 hectares. 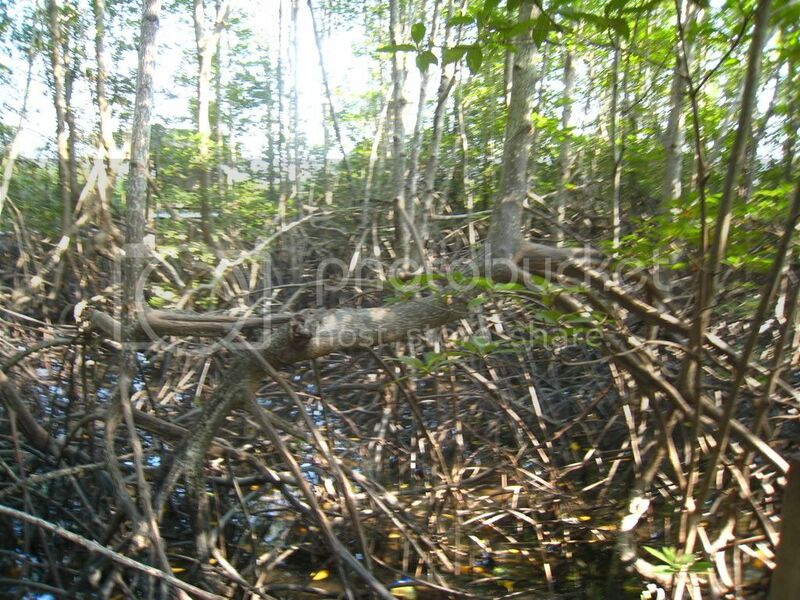 The forests consist primarily of Rhizophora trees that stand in the brackish water(saltwater and freshwater mixture) with their taproots branching out from their trunks down into the water. The Kung Krabaen Bay Royal Development Center is actively working to protect and preserve this unique habitat by reforesting another 82 hectares, as well as overseeing the entire area. When you visit the area, you can see Rhizophora tree saplings planted in straight rows. 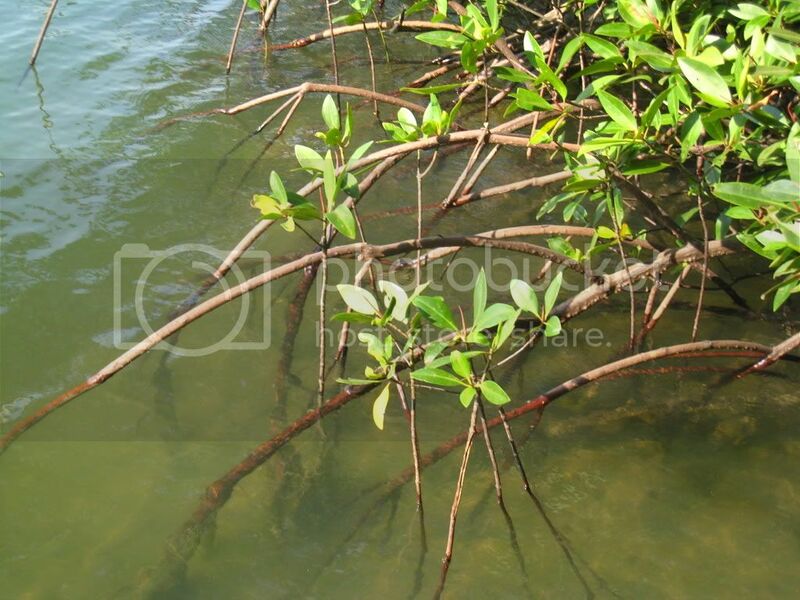 Rhizophora is one of the pioneer plant species in this ecosystem and as the saplings mature, they help buffer the coastline against erosion and expand the suitable environment for the creatures living in the mangrove forests. 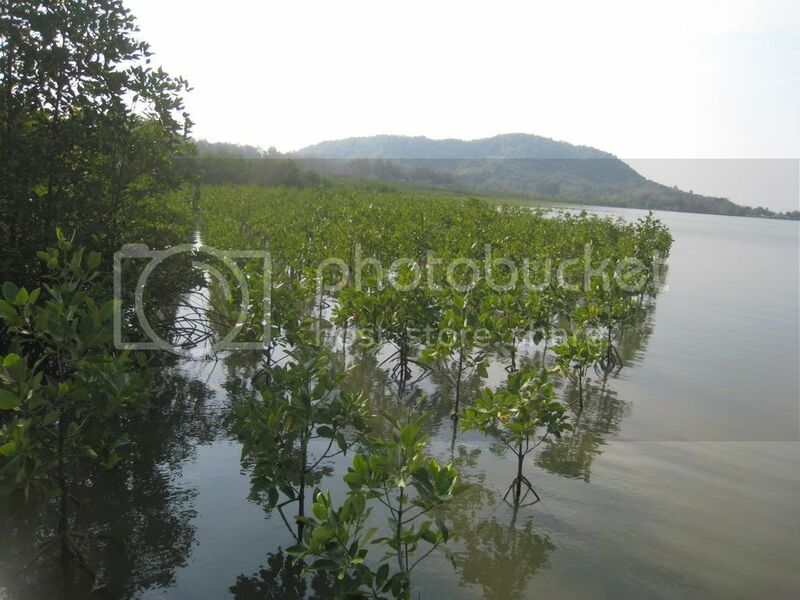 You can enjoy the Kung Krabaen Bay mangroves in one of two ways. 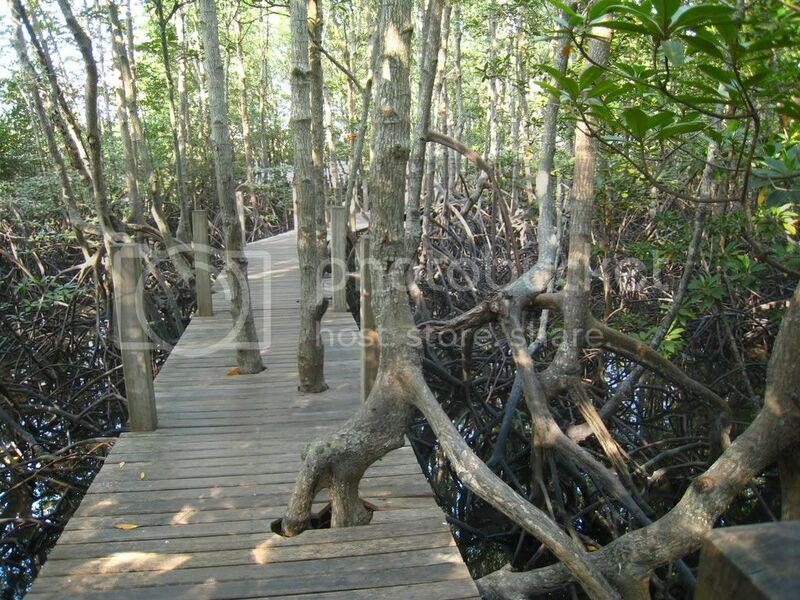 There is a self-guided Mangrove Forest Study Walkway that stretches 1.6 kilometers. It starts and ends in the reforestation zone and loops through older, more pristine forests. 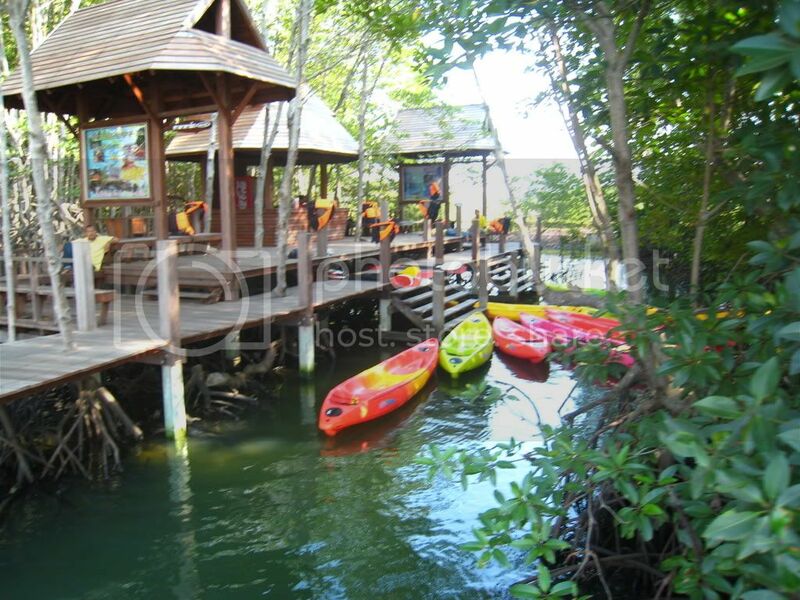 You will also venture through areas where mangrove and woodland forests meet. 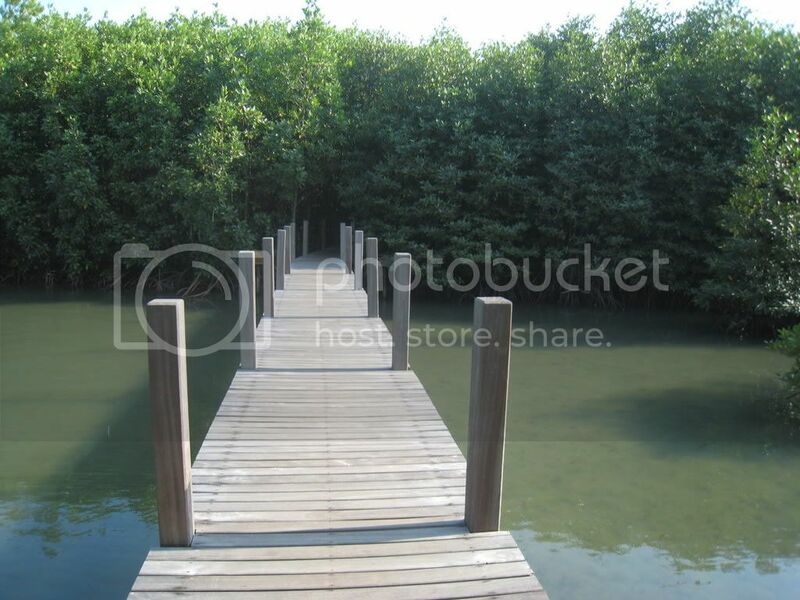 As you walk along the wooden walkway, you feel that you are walking with an “in the mangroves” feel. This is the ideal way to understand how the forest changes as it develops through the life stages from seedlings to mature forests. You can also see birds by day and fireflies by night. More adventurous visitors can take a ranger-guided kayak route along the seaward edge of the mangroves. The route continues through the shadowy depths of the forest along natural gaps in the trees and access channels. You will also pass an area where you see how locals acquire food from the mangrove forests by setting small cages for fish and crabs. The best time to visit is during the cooler months from November to February and the tide will determine when the tours run. There are many conservation efforts being made to protect the mangrove forests since the environment they provide is very important for various marine life. They are feeding grounds for sea animals and sea birds. At low tide, egrets, macaques and civets feast on the sea creatures exposed in the mud. Above the water’s surface, mangrove trees are homes for large waterbirds. Among the roots of the mangroves, many crabs, shrimps and young fish hide and live in the teeming waters. They spend their early lives in the mangrove forests before they are large enough to survive in the ocean. At Kung Krabaen, the mangrove forests also draw tourists. The additional revenue from tourism in the form of nature tours, homestays and other accommodations is another motivating factor for locals to help preserve the forests. Using motor fuels that are a blend of gasoline and ethanol is not knew. In fact, Brazil has been using ethanol since the 1970s. Nowadays, roughly 40% of cars in Brazil run on 100% ethanol. Brazil’s progressive actions were a result of a high gasoline prices due to the Middle East oil embargo in 1973. It took several decades to develop the ethanol production industry to the levels required to sustain such widespread use of gasohol. In 2004, Brazil was rated as the world’s largest producer of ethanol. Thailand has been one of the countries attempting to follow in Brazil’s footsteps. Currently, Thailand’s production of ethanol would not even meet the needs of a small amount of Thai motorists buying cars capable of running on pure ethanol. This means that for now, an ethanol blend is the most logical fuel for the current car market and ethanol supply. As cars start coming on the market that are specifically designed to run on fuel that consists of a large percentage of ethanol or pure ethanol, the ethanol production and supply needs to build up to meet the demand. The Flexi-Fuel engine is suitable to both pure ethanol and belended gasohol and is ideal for transitioning to an ethanol-based motor fuel economy. After extolling the many benefits of gasohol, it is time took at some of the negative aspects of gasohol use. Production In order to replace regular gasoline with gasohol completely, there must be a large investment of time and money to ensure that ethanol production increases rapidly enough to meet the motor fuel demand. Reduced Fuel Economy For fuel injected cars, there is a 2% drop in fuel economy when using gasohol. That means that you get slightly fewer kilometers per liter compared to regular gasoline. However, if you consider the amount of money you save each time you fill up, it is still cheaper to use gasohol. Not all cars can use gasohol It is unlikely that gasohol will damage your car engine, but that is the greatest fear of non-gasohol users. If your car is newer, check the car manual to see if it is capable of using gasohol or check with the manufacturer. As a whole, Thailand’s use of gasohol is a step in the directly of finding alternative fuels that are derived from renewable resources. The global demand for oil has resulted in high fuel prices and has taken a huge toll of the Earth’s environment as well. The benefits of using gasohol outweigh the problems by in large. It really is a win-win situation where the motorist saves money on gasoline, the Earth benefits from fewer harmful emissions and the local Thai economy will grow economically and become more independent of imported oil. Whether or not ethanol blended fuels will be the ultimate solution to the question of alternative motor fuels in Thailand is unknown. There are other alternative fuels such as NGV and LPG that are used primarily by taxis and vans. It is possible that these fuels will provide a better solution in the end, or even a new fuel solution that has not become mainstream yet. For the immediate future, however, gasohol and future Flexi-Fuel cars, which can run on ethanol and blended fuels, will provide lots of benefits to your pocket, your health and the world.